Vegetarian Cup Omelette is called Khai Toon Puk in Thailand. This menu for vegetarian and most famous of Thailand and Japan, it’s easy for cooking and delicious. And then use in period Kin Jay festival. That is good idea for Vegan. 1. Boil the stock cube in the water to form a soup and leave it to cool. 2. Blend the eggs with the pepper in a food mixer. 3. Add the stock to the food mixer and blend again (with the eggs). 4. Chop the long bean, carrot, corn and onion into small fine pieces. 5. Add the vegetables to the egg mixture and divide evenly between the cups. 5. Steam for 20 minutes. 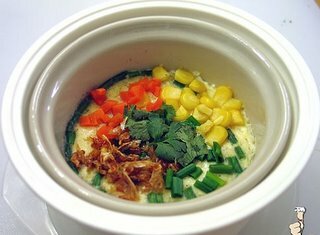 Enjoy your cooking and eating for vegetarian cup omelette.